Happy Friday people! Welcome to the Mama Elephant February Stampede! You've already seen the first looks at the March release on the Mama Elephant blog, and the new release is now live and available for purchase in the store here! For the Stampede, I created two CAS cards with the new set above called Hello. This set includes more handwritten sentiments by Kryssi which you know I can't resist! 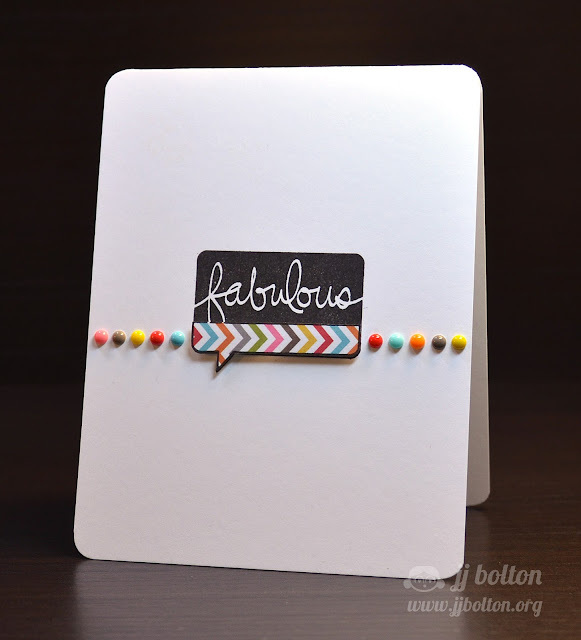 For my first card, I used the Fabulous sentiment bubble paired with some colorful patterned paper. Love how the stamped image is so crisp! To finish, I added enamel dots in the same yummy colors found in the paper. Fun, right? The next card has another sentiment bubble but this time I paired it with one of the matching phrases that fits perfectly in the bubble:) For the image, I used a circle die as a template to create the "Earth" using blended ink and then stamped the city scape from Believe in Magic over it. A bit of washi tape across the top and some strategically placed dots and it was done! Loving the graphic black and white! To celebrate the new release, Mama Elephant is giving away 3 gift certificates worth $20 each to 3 lucky people! Winners will be chosen at random from the collective blogs in the Stampede. Winners will be announced on the blog Monday, March 18th. The winners will have 48 hours to claim their prize. Thank you so much for stopping by!! Come back tomorrow for the start of the DT stamp highlights! Are you ready to see the new sets in action? Have an awesome weekend! love this set - love how you used it! I follow mama elephant blog. 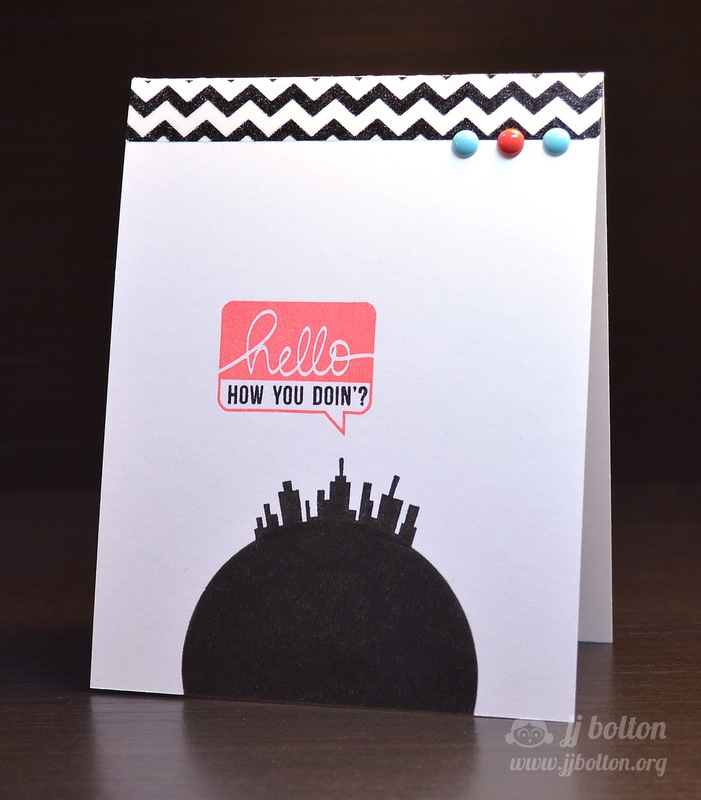 Love that 2nd card especially - the cityscape on a hill is so fab. OH. EM. GEE. That second card just about killed me, with it bein' all perfection, and all. Dang, woman. Simple, yet bold!! Great cards! I like how you paper pieced that little section under 'hello' in the first card, so perfect! love that first card JJ! So lovely! I love these cards JJ, so fun! And great use of enamel dots! LOVE how graphic the second card is and that great neon pink! I love love love your cards. the earth/circle with the skyline seriously made me say oh my gosh outloud. seriously. I totally love these!!!! Awesome! Both cards are great! I am going to get the stamp set. CAS cards....LOVE (sigh). Both of your cards are fabulous, but oh my, the second one is so unique and creative. Wow! You amaze! Two fabulous cards, J.J.! I love them both! Wow, love both of these simple and colorful designs! Your first card says it all--"Fabulous"! Love the graphic punch! Your cards are fab! I love all the colors on the first card. And the second card OMG the things you come up with. I am so totally amazed. Great cards! Love the enamel dots! Already a ME blog follower! Great cards. Like the mostly black and white too. TFS. Totally fun cards! I really love all those enamel dots on the first one! You're on one of those stroke-of-genius tours again. The skyline on the world - so cool. great cards! Love the CAS look! Love the graphic nature of both these cards...love the bubbles. I just love the sentiment on that second card! I'm laughing out loud! Fabulous cards! WOW!!! I am just crazy about these cards! Love the graphic black and white with pops of color! These cards are terrific! So graphic and striking. Just love them both. 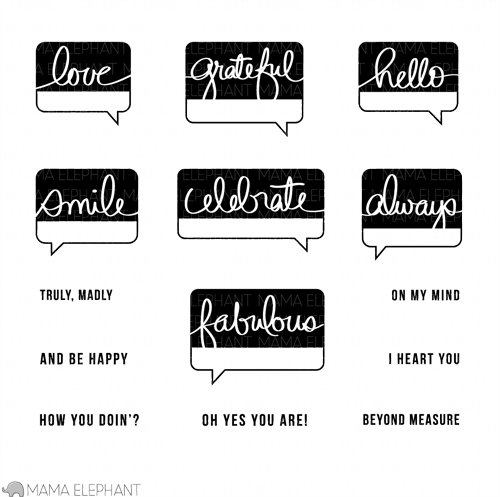 The sentiment bubbles are must haves! Love this set! JJ, your cards are awesome! Haha I'm so reading the second card with Joey's (from friends) voice in my head! Cool cards. I already like the mama elephant Facebook page. I'm already a follower of the mama elephant blog also. I adore the second card, especially the way you did the cityscape! Amazing! Love the technique. Love the cards! Thanks for sharing the ideas, JJ! Both cards are absolutely beautiful, but I simply adore how you used the cityscape stamp on the second card. Oh my, the "hello" coming from the city is genius!! LOVE! Love them both!!! I need to do more CAS cards! The second card!!! Love this set so much! The Hello card is just so cute! And I love the color you added to the Fabulous card too! I liked ME on FB! I am a follower of the Mama Elephant blog. So cool - love the sentiments and your fantastic cards that make me want this set like yesterday! Wow, you always make the coolest cards! I <3 this!! Love your cards! It really creates a punch! Love both cards, JJ! The earth with the little city is so cute! I follow the Mama Elephant blog. These are gorgeous! Loving those enamel dots and the city on the globe you created is awesome! !